"HELPO MI, HELPO MI, HELPO MI this is fast freighter Sundown, Sundown, Sundown. HELPO MI, Sundown. Position 154 by 20 by 17. Our craft is under attack and losing pressure. We require Immediate assistance. Four people on board, are taking an escape pod. OVER." Without starships, the interstellar civilization of the Thousand Suns would be impossible. Starships travel the jumplines, bringing not only passenger and trade goods but also protection against pirates and alien invaders alike. Other starships press onward into Wildspace, seeking out new worlds to explore, settle, and conquer. They are the vehicles of Man's destiny among the stars. Thousand Suns: Starships is a supplement that provides expanded options for starships - construction, operation, combat, and more. Fully compatible with the revised Thousand Suns Rulebook, Starships gives players and Game Masters alike the tools they need to build and utilize any starship they can imagine, from fast, manoeuvrable fighters to mammoth dreadnoughts. 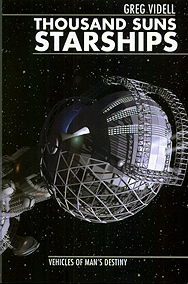 Designed to add depth without unnecessary complexity, Starships is an invaluable resource for any Thousand Suns campaign.